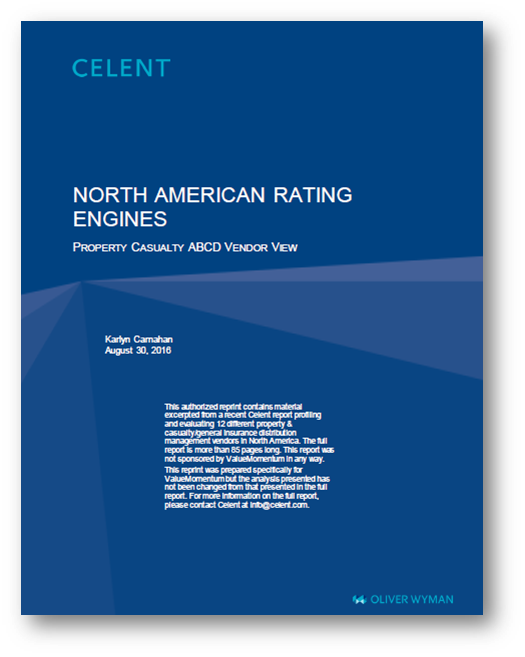 Celent's 'North American Rating Engines - Property Casualty ABCD Vendor View' report provides an overview of the stand-alone rating engines available in North America for property & casualty insurance carriers. The report published on August 30, 2016 profiled 12 stand-alone rating engines, providing an overview of the functionality, the customer base, lines of business supported, the technology, implementation, pricing, and support. This is a reprint of the report that covers ValueMomentum Inc. as a vendor for its iFoundry Rating Engine solution that helps P&C insurers with ease of modeling and managing proprietary rate plans and bureau rates. iFoundry Rating Engine's intuitive user interface makes it easy for a business analyst or business user to modify rates or algorithms. The product architecture is simple to understand and well organized. Carriers can easily create a library of rating rules that can be reused across products.